I did my Ph.D.-thesis at the Max-Planck-Institut für molekulare Physiologie in the group of Dr.Ingrid Vetter (former Department I) . 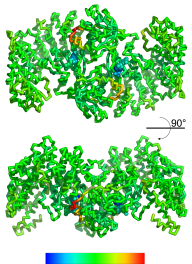 My work was related to the characterization, crystallization and structure refinement of Ran-binding Proteins involved in the transport-processes through the nuclear pores into and out of the nucleus of eucaryotic cells. 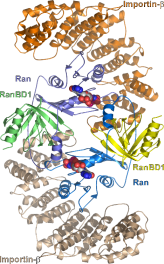 I crystallized a ternary complex of Importin-beta bound to Ran and a RanBD1 fragment, proving that such a ternary complex could exist -at least in vitro- and form a stable intermediate in the import-export process through the nuclear pores. I also did some biochemical analysis regarding the dissociation of this complex. You can download my thesis (in german) from the Deutsche Digitale Bibliothek. Parts of it have been published. From left to right: Crystals of the ternary complex, B-factor distribution of the structural model, the asymmetric unit with two complexes. This page was last modified on 16 January 2017, at 17:46. This page has been accessed 29,976 times.